AMID the hustle and bustle of the food court on the first floor of Pavilion Kuala Lumpur sits a stylishly decorated restaurant, tucked away in a corner. To put it simply, the food was good; the service, friendly; and the decor, modern and relaxing. This time, it was just Dilly (Red Breakfast) and I, and our photographet Kah Wai sitting down for a cosy meal. We tasted all kinds of dishes, starting off with the otak-otak. Fragrant banana-leaf parcels of spicy fish mousse gently steam-cooked to a melt-in-your-mouth consistency. 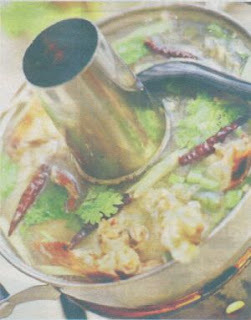 For a hot and spicy soup, try the clear Hot and Spicy Seafood Tom Yam, overflowing with generous portions of prawn, squid and fish. And, for a cold starter, try the March Mango Salad with Crispy Catfish, drenched in sugar and lime. Dilly almost licked the plate clean! One of my favourites was the Sizzling Japanese Beancurd with minced prawn andchicken. There is something about sizzling dishes that makes my mouth water even before I have seen what is coming. The subtle "hiss" as the food cooks on its journey from kitchen to table, followed by the heady scent of garlic and oyster sauce, and the visual of the dish actually sizzling before your very eyes ... it makes the taste explode when it reaches your tongue, hot off the plate! Staying true to its name, Rain Nudle House offers an assortment of noodle-based dishes that reflect the various flavours inherent in Thai fare. The noodle dishes were packed with flavour and impeccably cooked. I liked the Stir Fried Koay Teow with Chicken and Light Soya Sauce, served with Thai Chilli Prawns, and was informed that people came from near and far to savour the Thai Beef Balls Noodle Soup, a house speciality. But, it was the Thai Laksa served with Green Curry Chicken we ended up tasting instead. I was pleasantly surprised when, instead of a bowl of soup, a plate arrived at our table. On the plate were three portions of laksa noodles, French beans, pickled cabbage, bean sprouts, basil and a bowl of green curry. This is a great way to eat, because you can make your own laksa, and adjust the amount of ingredients to get it just the way you like it. Kah Wai adored the Stir Fried Pasta with Sweet and Sour Prawn. Cooked in a thick red sauce with a generous helping of prawns, it is an Asian twist to the Italian Fusili. Good to enjoy on its own or as a sharing dish. What I enjoyed most of the experience was the ease in which we enjoyed our food. Simple, quick yet relaxing. A haven of calm amid the hustle and bustle. Sipping on a tall cool drink of Lemongrass Juice, I felt rejuvenated and ready to continue my shopping. Modern Thai for the modern woman; that I liked very much. Try Rain Nudle House for yourself! Starting Monday May 4, listeners will have a chance to win RM100 vouchers in The Big Red Food Review, Eleven2Three with Aly. Only on Red FM, Today's Best Music.